Hi there!!! Sorry I haven't been around lately. I've been working a lot lately and have been trying to enjoy the last bits of summer. This week at Stamping Bella, we had a fantastic sketch to work with. I was waiting for some fantastic SB goodies to arrive but knew I had to get my card made. Of course, no sooner did I finish my card and I heard the package come through my mail slot. LOL!! 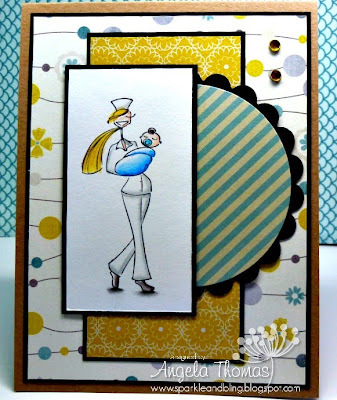 For my card, I decided to use Babynurseabella that I hadn't inked up yet (even though I've had it for a few years). The image was inked up with Archival Black ink and then colored with Prismacolor Pencils and Gamsol. The DP is some older Pink Paislee called Indigo Bleu. Hope you like it!!! Next week's challenge is called "Flower Power". We want to see your floral cards!! !